This is one of the worst movies I've ever seen. Not "so good it's bad," not "guilty pleasure," just a purely stupid movie. Two brothers live together after the death of their parents several years before. A friend of the older brother's dies, and at the funeral they notice strange things afoot at the funeral home. Blah blah blah, long story short - the funeral home director is like 300 years old and resurrects the corpses as his slaves, but the process he uses also shrinks them down to dwarf-size and he dresses them in tiny brown hooded robes so that they look exactly like the Jawas from Star Wars. Now, I ask you, if you were to make a horror movie, do you think you could find monsters a little more frightening than Jawas? I could go into the bathroom right now, and make myself look more frightening than a Jawa, using only things from my wife's make-up case. 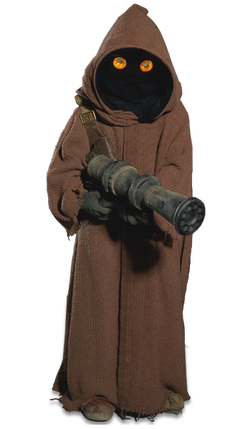 This is a Jawa. The only thing frightening about him is that he's carrying a gun. Maybe if the zombies in Phantasm had been carrying guns, they'd have been frightening, too. Also, although this picture gives you no sense of scale, it comes up about to Mark Hamill's waist, and Mark Hamill is only like 5'9". I hate you, Phantasm. I give you zero nothings out of nothing. You get no rating because you deserve none. Wow, Danny, that's harsh. I remember watching the better part of Phantasm on TV some Sunday afternoon when I was like 10, and I'll tell you, that old man and the seeing, flying silver ball of death scared the everliving shnikies out of me. I don't know Danny. I used to always think those little glowing eyes were scary. When I was, like, 4. @Kyle - if they'd made the flying death balls the center of the action, that could actually have been a scary movie. Or if they'd shown more than one brief shot of the alien dimension where the guy was sending his slaves, that could have been cool, too. I remember this one to be better than your review. Looks like it hasn't aged well at all. that's the problem with movies from our youth, and memories in general i suppose, we tend to forget the pain and remember only the pleasure and/or we were just newly minted 14 year olds with a greasy hair and a booger, and if you were really lucky, hey! cystic acne, whoopee! btw, apparently our beloved karate kid hasn't aged well either. and you'd be scarier than a jawa, uhh, because a cross dressing giant who got into his wife's makeup bag is terrifying. oh. and i just realized i forget to enter the authentication text on a couple of posts i made to validate them and actually post. i am now going to go shoot myself in the face. i could make myself more scary just by FOREGOING the makeup.